You can’t know if you’ve arrived if you don’t know where you’re going. That’s especially true for marketing. Making people aware of your brand and product isn’t enough. It’s difficult, if not impossible, to measure results of a marketing campaign if you have not established goals. By now, you’ve surely heard the term “SMART goals” being used, whether by your company or by others in your market. Businesses around the world are pushing for more SMART goals to drive their marketing strategies, but what does that really mean? And why should you strive to make every goal a SMART goal? Why Should Your Goals Be SMART? SMART goals are more than just a marketing buzzword. SMART is an acronym, standing for Specific, Measurable, Attainable, Relevant, and Timely. Following this framework allows companies to set goals that are realistic and based on actual data. The time you spend creating SMART marketing goals will more than pay off in keeping your employees focused, helping you discern whether your goals are on target, and pointing out how individual marketing efforts are performing. Well-conceived marketing goals will also help you stay on track during business challenges and be less likely to simply run from fire to fire. As you take the time to create your marketing goals, keep the SMART framework in mind. You need to establish measurable goals. Saying you want to increase site traffic or get more leads is too vague; how will you know if you’ve reached your goal? Instead, say that you want to increase site traffic by 20% in the coming year or that you want a 30% increase in leads within six months. The more detail you can provide, the better. Your goal may be specific, but you’re out of luck if you can’t measure your results. Make sure that your goal has a measurable outcome and that you have the tools and data required to actually measure marketing effectiveness. While any business would like to triple their sales in two months, that is rarely attainable. Establishing an expectation that your sales force of three people will make 10,000 client visits in a year is similarly unrealistic. Setting unattainable goals wastes your time and the opportunity to create a sound marketing plan. It can also adversely impact your employee morale and motivation. Simply put: your goals should support your business objectives. Is your company trying to increase branding, lead generation, or something else? When you have a clear idea of your business objectives, you can set relevant goals that will help you get there. You must include timelines in which you’d like to reach your goal. Perhaps you want to increase the number of email marketing campaigns to two per month or increase your sales by 20 percent come June 1st of next year. Including dates allows you and your team to know if your goals are on track and when to tweak marketing efforts to reach goals in time. Be Flexible. Marketing goals should be flexible enough to adapt to changing market situations. While you can predict what your business will do in the future based on past performance, no manager or owner can predict things like a natural disaster, business lost due to construction on your access roads, or a national or international economic downturn. Strong marketing goals are adaptable to fit within changing business environments. Allow your goals to support one another. Great marketing goals overlap, rather than stand alone. Ideally, each goal should be just one piece of a larger marketing plan. Your goals should complement each other, and not detract from each other. Consider your budget. Everyone would like to do 100 hours of marketing work per month on a ten-hour marketing budget. That is not realistic. As soon as your goals are set, determine the specific tasks you’ll need to get done to achieve your goals, and create time estimates for each task. Prioritize which tasks get done by how likely they are to help you achieve your goals, and how much time each task will take. Understanding the SMART framework is important, but many brands still don’t know where to begin. How do you decide what’s most important? How will you measure your progress? How will you know if your goals are attainable or completely unrealistic? 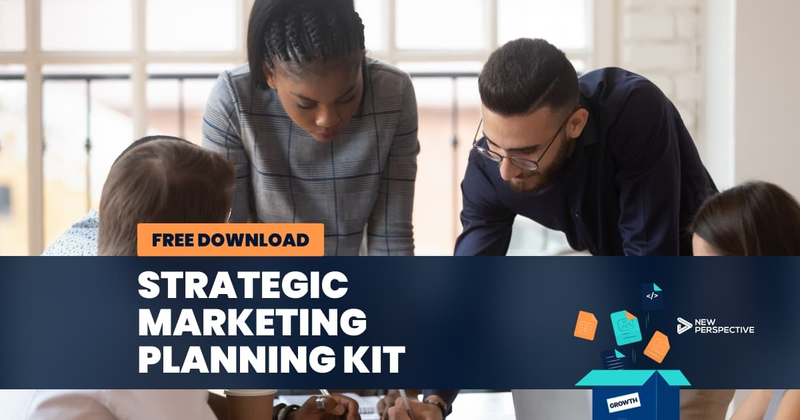 We know that SMART goal-setting can seem daunting at first, which is why we included a SMART goal template in our free Strategic Marketing Plan Starter Kit. The template will help you decide what type of goal you want to create, gather baseline data, and set a realistic goal. Don’t forget to take a look at the other documents in the kit! Together, these templates are designed to help you create a marketing strategy designed to reach your unique goals.